The Daily News of Open Water Swimming: What Do You Run Into? What Do You See On Shorelines? What Do You Run Into? What Do You See On Shorelines? Courtesy of 5 Gyres, Los Angeles, California. Open water swimmers often campaign against the rising amount of plastics in the world's oceans. But what exactly comprises of these plastics? 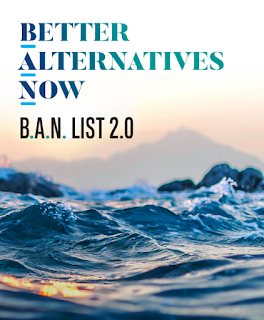 Marcus Eriksen, co-founder of 5 Gyres, tells us with his latest Plastics Better Alternatives Now (BAN) List 2.0 that ranks the most polluting plastic products in terms of how much is out there, how likely it is to be recovered, and how toxic it is. In 2017, 5 Gyres released B.A.N. 1.0 that focused only on California. B.A.N. 2.0 covers the entire United States where plastic food wrappers, bottle caps, beverage bottles, bags, and straws wash up and pollute the East Coast, West Coast and Gulf Coast. Eriksen writes, "We looked at brands too and included a study on biodegradable plastics that may surprise you. Next year, we'll be releasing BAN List 3.0 with data from our partners across Southeast Asia, as part of the Asia Pacific Action Against Plastic Pollution. BAN List 3.0 will not only include a list of the most polluting plastic products, but a road map to achievable solutions reversing the rising accumulation of plastic in our oceans." 5 Gyres utilizes Litterati, a mobile app that allows users to document corporate logos or names on polluting plastics. For more information from 5 Gyres, visit here. For information about 5 Gyres, visit www.5gyres.org.